The TRICORN:Scheduler software is a workshop planning tool designed to help engineering and manufacturing companies optimise their resources and plan production to achieve delivery efficiencies and cost targets. Seamlessly integrated into TRICORN:Production, TRICORN:Scheduler updates the plan instantly as production requirements change, and as manufacturing events are recorded in the factory and offices. Having accurate, detailed, and live data ensures that the schedule reflects the true situation on the shop floor, allowing managers to take appropriate action based on factual information. The development team at Tricorn has ensured that, as with all its products, TRICORN:Scheduler is easy to use. A drag and drop interface with one screen technology makes manipulation of the resources and jobs both fast and efficient, while a choice of data entry methods simplifies data collection, minimising disruption and maximising productivity at each workstation. Additionally, clear reporting highlights the delivery status of each job, enabling users to meet the requirements of their most demanding customers while controlling costs and optimising profitability. Clear Gantt chart style graphics are easy to understand and familiar to planners, allowing them to visualise the resources available and the jobs to be completed. In addition, a choice of bar code readers, touch screens or terminals simplify data collection around the factory. TRICORN:Scheduler includes a drag and drop interface which eases the rescheduling of tasks to suit changing circumstances. The results of changes are automatically calculated and graphically displayed, showing the impact on delivery dates across the whole schedule. Traffic light colour coding quickly highlights jobs which are on target for delivery, those which are nearing their due date, and those which are overdue. TRICORN:Scheduler is an integral part of Tricorn’s Job Processing Software (TRICORN:Production), sharing the same database. This ensures that any changes made in the Production Control Software are automatically and instantly reflected in the Scheduler. Similarly, any change to the schedule, such as a completed operation, absence or subcontracting is immediately reported back to TRICORN:Production. Clear and easy to use one-screen technology ensures rapid training and fast software implementation. Users can be productive very quickly, modelling their processes in TRICORN:Scheduler and profiting from instant status reports, which will enable them to optimise their efficiency levels. Jobs and operations are automatically loaded into TRICORN:Scheduler from TRICORN:Production. Through complete integration, new work, including individual components and multi level assemblies, immediately becomes part of the schedule, enabling users to graphically see the effect on delivery dates and resources. Live recording of events from around the factory feed back into TRICORN:Scheduler. This keeps the schedule up to date with the current status of production, so information about work in progress, the machine loading for each resource, and the on time delivery status of each job will be accurate. Viewing terminals make it possible to share this information around the factory. TRICORN:Scheduler makes it easy to try “what if” scenarios. Adding extra resources, moving operations, and changing shift patterns can all be tested with real data. Gantt chart graphics show the results, allowing managers to optimise the utilisation of resources, reduce manufacturing times, cut work in progress, deal with bottlenecks and increase productivity. Projected new orders can be sent to TRICORN:Scheduler to see if capacity is available to complete the job in time and achieve the requested delivery date. These "dummy" works orders can be removed from the Scheduler if the order is not received. 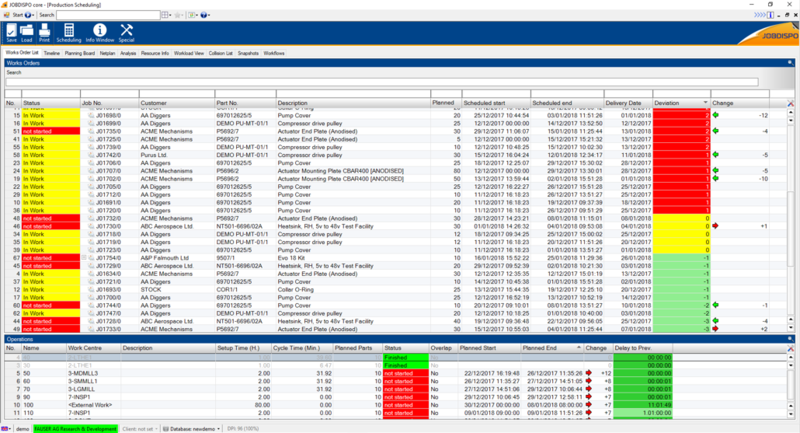 Interactively managing the schedule, with its drag and drop interface, automatically reflects in the reports available in the software. Traffic light graphics highlight jobs that are within their delivery target, those which are close to their target and those which are overdue. Users have reported an 80% increase in on-time delivery, 50% reduction in work in progress and 25% increase in productivity through active management of the schedule with TRICORN:Scheduler. TRICORN:Scheduler models the resources available to manufacturers, including work groups, holidays, absences, shift patterns and subcontracting, to provide a true snapshot of what is available at any instant. Tools to change the model allow daily variations, like just-in-time orders, machine breakdown or overtime, to be quickly incorporated and viewed in real time. Look ahead facilities make it possible to check the capacity of each resource and test the impact of new contracts on the ability to deliver on time, up to one year in advance. Analysis of the status of each resource will highlight both bottlenecks and spare capacity, giving managers sufficient information to allocate additional facilities or search for suitable new work. 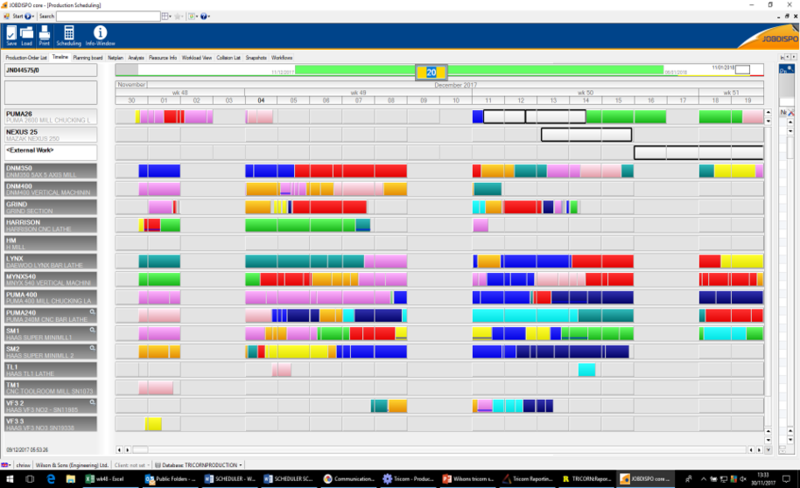 The drag and drop interface enables “what if” interrogation of the schedule. By moving tasks and altering resources users get instant graphical feedback, enabling them to see the impact of changes such as new orders, subcontracting, new equipment, altered shift patterns and alternative processes. Resource management in TRICORN:Scheduler makes it easy to optimise the use of manufacturing facilities, maximising productivity, return on investment, and profit. TRICORN:Scheduler utilises live data throughout the system, providing information such as work in progress, the status of delivery schedules and hours spent on each job. This is collated using data gathered from around the factory through bar code readers, touch screens and terminals. Hence the resulting reports are an accurate snapshot of the progress of production. Each individual resource, including a sub-contracted one, can be analysed to show, for example, the load, start and finish times for individual operations and time spent on each job. By sharing the information with Tricorn’s Production Control system, actual performance can be compared with the plan at any stage of manufacture. This allows appropriate remedial action to be taken to keep costs under control before the job is completed. Reporting will also identify bottlenecks and spare capacity. Analysis of how this varies and when it occurs will enable managers to maximise the utilisation of their resources based on real information. 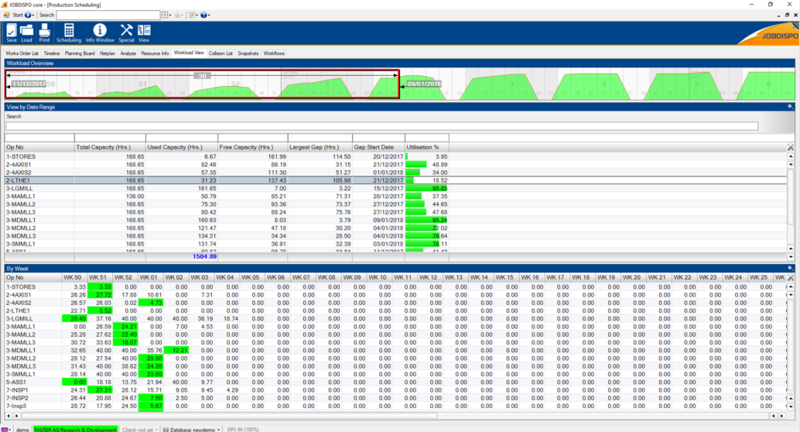 Highlighting when parts will be delivered is a key reporting function. 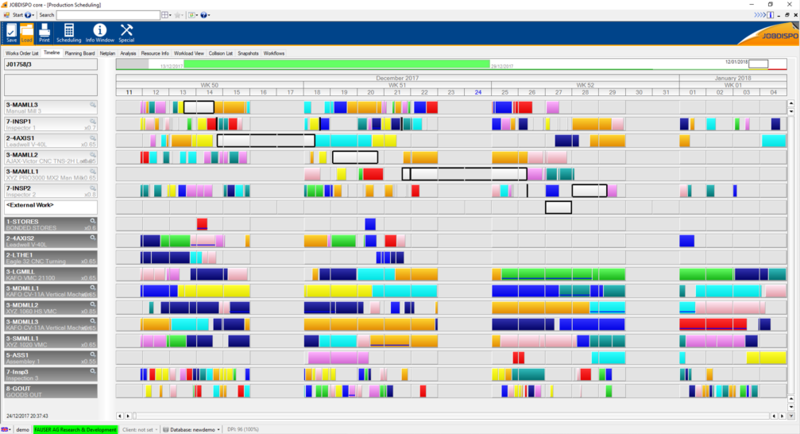 TRICORN:Scheduler shows the current status of each job, with a colour coded traffic light system - green for within its planned time, amber for nearing its completion date, and red for overdue. Users can see at a glance which jobs need attention and have reported increases in on time delivery of 80% with the software. The live and accurate management information generated by TRICORN:Scheduler makes it easy for companies to optimise their processes, control cost and improve their performance as a supplier.